Walking along the thronging streets of Saigon we are always assaulted by the myriad of sights, sounds and smells of street life. The social gatherings spilling out of cafes, wonderstruck tourists grouped to check maps or take photos, food vendors, shoppers, office workers, traffic police, shoe repairers and lottery ticket touts. post down every street or occasionally to admire the architecture or the huge rainforest trees that line the avenues. But walk towards the river and emerging from the maze of high rise and crowded streets the vista begins to open and the enormity of Vietnam’s amazing skies is revealed. Take some time to stand on one of the bridges over the rivers that meander through Saigon and if you are elevated high enough you can see the skies extending into the blue of 50 miles or more. As an artist, I am captivated by skies. I love to stand and watch the ever-changing vista above me. One of my favorite vantage points is Thu Thiem Bridge. From there, on sunny days, it is blue as far as you can see. Everywhere twinkles in the sunlight and the river sparkles with diamond lights. The wide blue sky is dotted with puffy white clouds. People bring their kites to fly above the open flat acres of the Thu Thiem peninsula. As I watch them from the bridge my spirits soar just like the kites. Even on stormy days I love to watch the rain clouds moving across the cityscape. You can see them coming for miles and miles always preceded by that powerful rush of warm wind that heralds heavy rain. Moody, malevolent and magical. From my top floor studio I can see every aspect of the daily displays from delicately misted yellow sunrise through mornings of sunshine and showers to the end of the day when strident flares of sunset gather then shrink back behind purple and orange clouds, their last glow soon snuffed out like a candle’s flame as it vanishes beyond my horizon. When teaching watercolor painting, the very first lesson is about skies because this is where a landscape painting usually begins. I show students how to create clouds using yellows, browns, violets and red and by pulling paint off the paper with tissue, sponges and dry brushes. 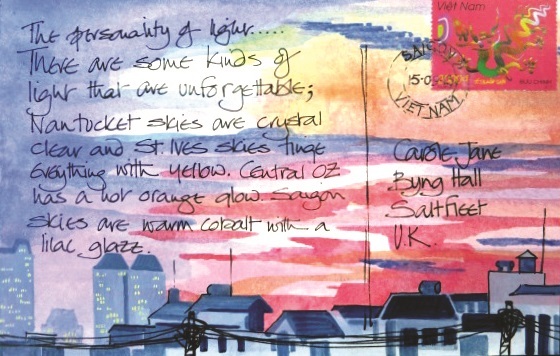 Suddenly they can see an exciting sky appear on their paper, which gives their landscapes drama and movement. But, the most lasting change that results is that they begin to pay attention to, and even start to watch, what is happening in the big, beautiful Vietnam skies they may previously have never noticed.